Home Luni-solar: You Ask, We Answer Luni-solar Calendar How does Acts 20:5-7 show that Luke used a Luni-Solar calendar to record the details of Apostle Paul's traveling? Question: How does Acts 20:5-7 show that Luke used a Luni-Solar calendar to record the details of Apostle Paul's traveling? The Biblical Luni-Solar Calendar is confirmed! Laying the papal Gregorian calendar over the Biblical narrative places Paul's meeting with the disciples on the third day of the week, not the first. Even if we were to suppose that the first month here was a 29-day month, Paul's meeting with the disciples would have fallen on the second day of the week. Again, it is simply not possible to make this work with the modern Gregorian calendar and its continuous weekly cycle. 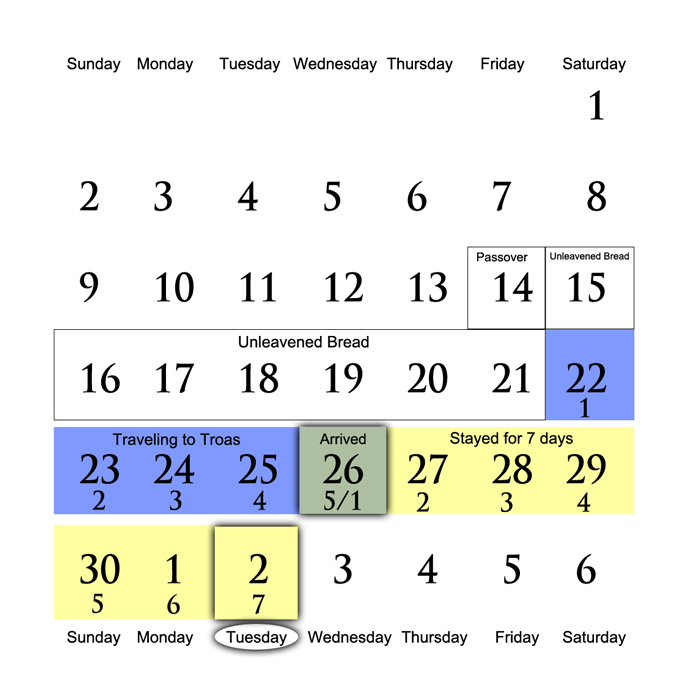 Some have suggested that Passover and the Feast of Unleavened Bread are not fixed to specific days of the week. 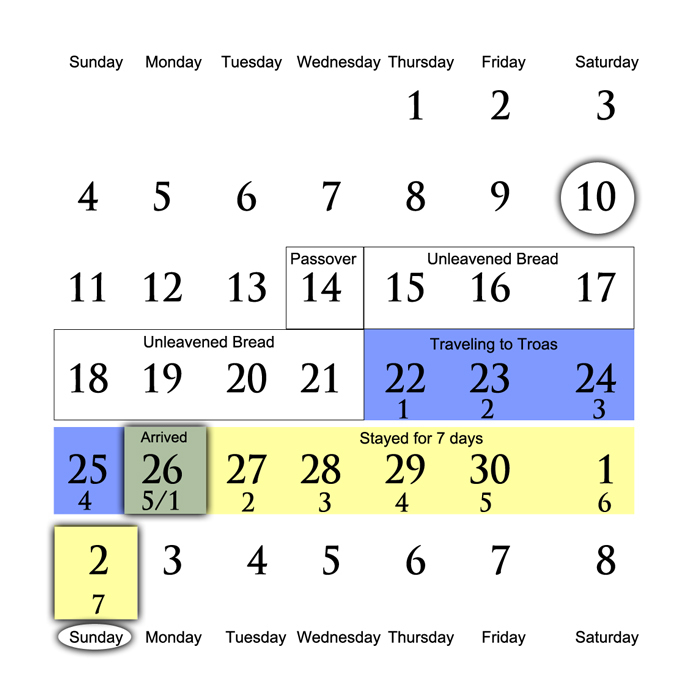 They say that Passover, in this scenario, must have fallen on a Wednesday - because this is the only way that Paul could have met with the disciples on the "first day of the week" (without abandoning the continuous weekly cycle paradigm). This scenario does place Paul's meeting with the disciples on the first day of the Gregorian planetary week. 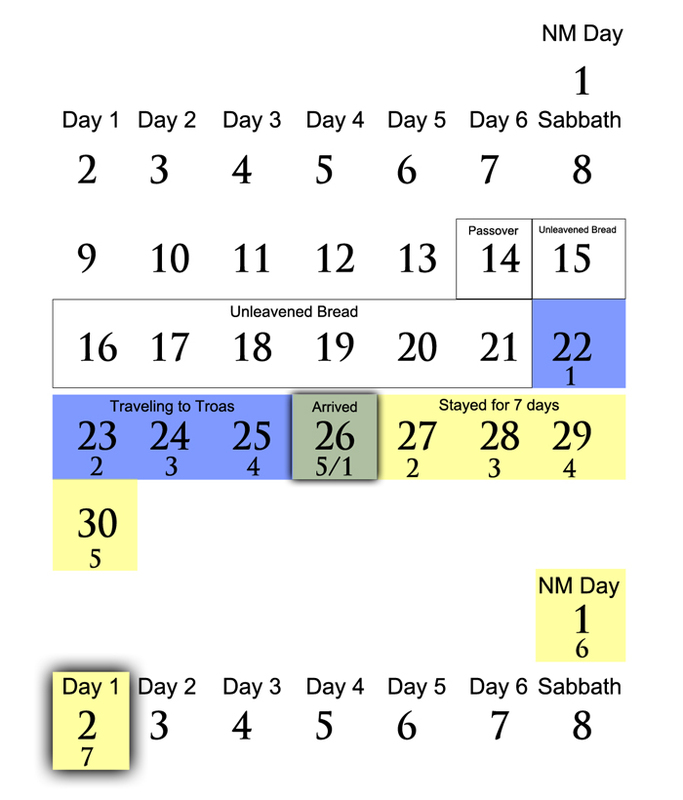 There is, however, a very clear problem here: the 10th day of the month falls on the seventh day of the Gregorian week - Saturday (here supposed by Gregorian calendar advocates to be the Sabbath). The 10th day of the first month cannot be a Sabbath, though, for this was the day that the children of Israel were to select their Passover lamb. This was a work day, a commerce day (not a Sabbath), because those who did not own a lamb had to purchase one on this day. Again, the proposed scenario here does not fit. Only the Luni-Solar Calendar, which restarts the weekly count with each New Moon, successfully harmonizes all of the details of Luke's narrative. 2 It could be argued that Paul actually left the night of the 21st, placing him in Troas on the 25th. This is a possibility, but does not disturb the Luni-Solar paradigm in the least. A 29-day month would still place Paul's meeting with the disciples on the "first day of the week." The modern Gregorian calendar, however, cannot be harmonized with the details of Paul's journey.